Former All White, clinical psychologist and forensic psychiatrist Dr. Ceri Evans has been in high demand by prominent athletes, coaches and teams around the world for his mental skills expertise, ever since helping the All Blacks win back-to-back World Cup titles in 2011 and 2015. Working as an independent consultant, his clients have included the likes of Premier League giants Arsenal, Formula One drivers Lewis Hamilton and Nico Rosberg and Heavyweight fighter Joshua Parker. Following in the footsteps of his father Gwyn Evans, a former professional footballer for Crystal Palace who later became New Zealand Football Association General Secretary, Ceri Evans has always had a passion for the world game. With 85 caps for the All Whites as well as a five-year professional career with Oxford United while a Rhodes scholar at Oxford University studying psychology, Evans knows all about what it takes to perform under pressure. Today the mental skills specialist was at hand to share some of his valuable insights with the participants as a guest speaker at the FIFA/OFC Instructors Course thanks to an invitation from OFC Head of Education Giovani Fernandes. “I have an old friendship with Gio,who has invited me along and I also know a few people in the class through the OFC/NZF A-Licence course as well. “I’m a passionate New Zealander and we are part of Oceania and I’m really invested in helping Gio and the other instructors by providing some stimulating ideas for the people to take back to their countries,” the guest speaker said. When it comes to pressure and performance there are a number of commonalities across athletes as well as sports that require a common framework according to Evans. Evans believes that identifying and isolating some of the differences and specific needs of regions like Oceania is just as crucial. “I’m here to assist with an understanding of the region, that is part of the brief and so knowing some of the people I only know some of the challenges and that’s why it has to be about the fit, about certain principles and what do they mean for this particular region. “It’s important not to drop in some principles from one region to another as if it’s going to work the same way,” he says. “The brief I have received is to explore a couple of areas around mindset applicable to the region and what the next step is for people to provide challenging questions in that space. “So the idea is to pose a couple of questions and then maybe a couple of ways of looking at that to try and help people develop,” Evans explains. 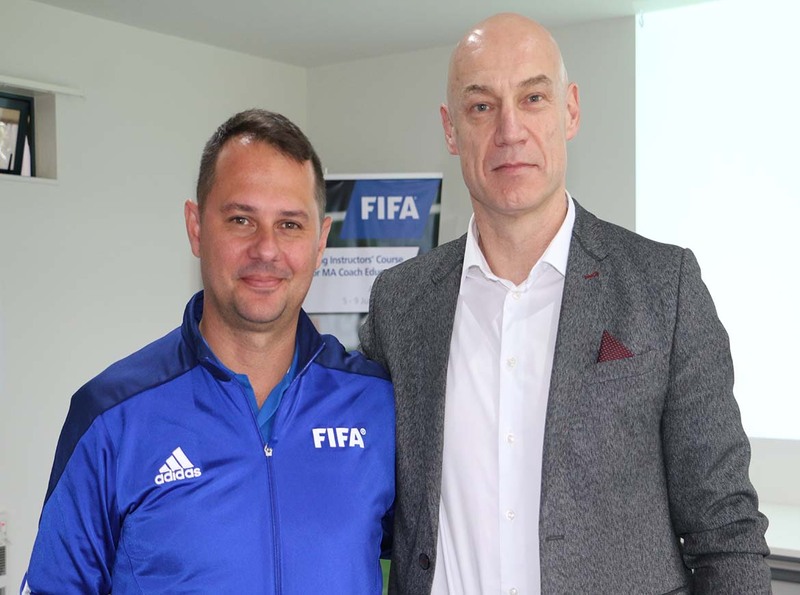 With 19 coaching educators from ten member associations at present at this week’s FIFA/OFC Instructors Course at the OFC Academy in Auckland, Evans is confident it is the best possible forum to provide the participants withwith some practical tools that they can use to help get the most out of their players when it comes to pressure situations. “Coaches and athletes have a special relationship in my view. “But coaches have the responsibility when it comes to assessing up that environment, they are the leaders of that environment,” he says.